It’s getting close to the holidays, and if you’re anything like us you’re on the hunt already for gift ideas, especially for your little ones. Chuggington has released two new track sets from TOMY just in time for gift-buying – Koko’s Safari Set, and Brewster’s Icy Escapade set. As Chuggington Conductors, we got to try out the Koko’s Safari set. 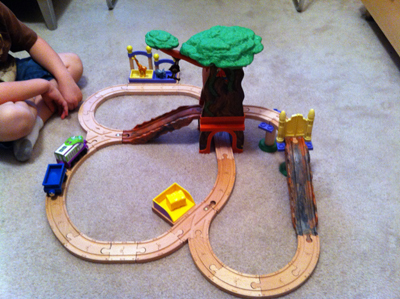 It’s a 38-piece wooden set that has elevated tracks, a 2-in-1 safari tree tunnel, and a door and a gate for trains to go through. It even makes jungle sounds, which adds a level of fun to it. It retails for $99.99 and is available exclusively at Toys R Us. The boys were really excited when we arrived and couldn’t wait to open it. 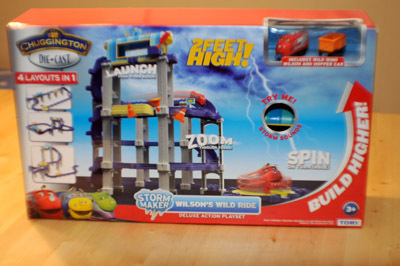 Trains in general are going to be exciting to them, but I think seeing the tree and the two levels of tracks on the box gave them an immediate idea of how fun this set would be. 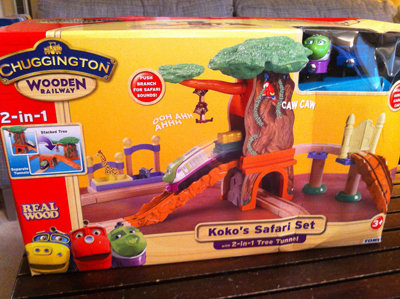 One winner will get their own Chuggington Koko’s Safari Set! This contest is open to all U.S. residents aged 18+.Entries will be accepted until the end of the day (midnight Central) Wednesday, November 7. By entering this giveaway you agree to the Official Rules. 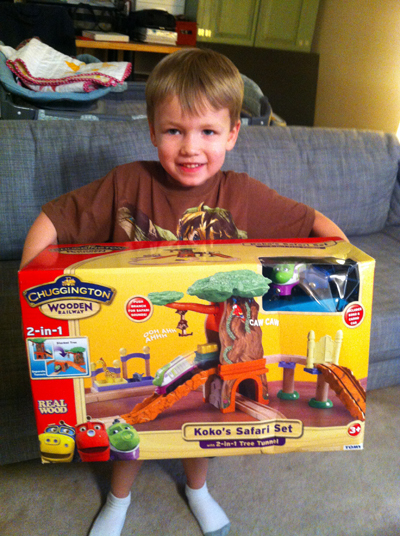 Note: As Chuggington Conductors, we received a Koko’s Safari set to facilitate our review. I was not compensated monetarily for this post. All opinions are honest and are my own. My favorite safari animal is a lion, the king of the jungle, they are beautiful! Tigers or zebras. Love the stripes! Monkeys are my favorite safari animals!! I love elephants and giraffes! My favorite safari animal is zebras! My favorite safari animal is the giraffes and zebras!! I love the giraffes and elephants!! I just checked with my son and he agrees, elephants rule!! :-) Thank you for the opportunity to win. I like the Lions. They always look so Chill! A Tiger is my favorite. Elephants are my favorite Safari animal. I love the zebras and giraffes!